Professor of Biology Susan T. Lovett was elected a fellow of the American Association for the Advancement of Science. AAAS fellows will be recognized for their contributions to science and technology on 16 February 2013 during the AAAS Annual Meeting in Boston. Brandeis alumni elected as fellows are Steve Alexander (PhD ’76), Patrick Casey (PhD ’86), Rui-Ming Xu (PhD ’90) and Charles Brenner (postdoc 93-96). Lovett, who works on DNA repair mechanisms in bacteria, has recently been profiled on Brandeis NOW. Recent Brandeis Ph.D graduate, Tracey Seier (Molecular and Cell Biology Program), Professor Sue Lovett, Research Assistant Vincent Sutera, together with former Brandeis undergraduates Noor Toha, Dana Padgett and Gal Zilberberg have developed a set of bacterial strains that can be used as “mutational reporters”. Students in the Fall 2009 BIOL155a, Project Laboratory in Genetics and Genomics, course also assisted in the development of this resource. This work has recently been published in the journal Genetics. These Escherichia coli strains carry mutations in the lacZ (β-galactosidase) gene that regain the ability to metabolize lactose by one, and only one, specific type of mutation. This set allows environmental compounds to be screened for effects on a broad set of potential mutations, establishing mutagen status and the mutational specificity in one easy step. This strain set is improved over previous ones in the inclusion of reporters that are specific for certain types of mutations associated with mutational hotspots in gene. Mutations at these sites occur much more frequently than average and involve DNA strand misalignments at repeated DNA sequences rather than DNA polymerase errors. Such mutations are associated with human diseases, including cancer progression, and have been under-investigated because of the lack of specific assays. Using this strain set, Seier et al. also identified a mutagen, hydroxyurea, used in the treatment of leukemia and sickle cell disease, which affects only the “hotspot” class of mutations. This strain set, which will be deposited in the E. coli Genetic Stock Center, will facilitate the screening of potential mutagens, environmental conditions or genetic loci for effects on a wide spectrum of mutational events. As a self-confessed prokaryotic chauvinist, I’m always on the lookout for new interesting papers aimed at understanding bacterial metabolism and regulation. A recent paper in Cell, entitled “Phenotypic Landscape of a Bacterial Cell” by a group of authors including Biology Professor Susan Lovett demonstrates the application of high-throughput screening to finding new bacterial phenotypes. Approximately 4000 E.coli mutant strains, representing deletions of individual non-essential genes, were plated on 324 different media representing a total of over 100 different stress conditions, and the growth followed by image analysis. Approximately half of the genes screened had one or more identifiable phenotypic repsonses. This approach allows the identification of genes that are conditionally essential, genes that are involved in multiple resistance, etc. This represents a new automated method for identifying phenotypes (hence “phenomics’) and understanding the roles of genes of as yet unidentified function in bacteria. The data set is publicly available at http://ecoliwiki.net/tools/chemgen/. In a new study appearing in PNAS this week, Brandeis Molecular and Cell Biology graduate student Houra Merrikh and co-workers from the Lovett lab identified the E.coli gene iraD as a regulator of the response to oxidative DNA damage in exponentially growing bacteria. Interestingly, the mechanism seems to involve the alternative RNA polymerase sigma factor RpoS, previously characterized as a regulator of expression during the “stationary phase”. Merrikh et al. argue that this response works in parallel with the previously characterized SOS response in protecting growing bacteria from DNA damage. The stringent response in E.coli is a response to nutrient (typically amino acid) starvation and is characterized by the accumulation of the small molecular regulator ppGpp, and a global response in transcriptional regulation. 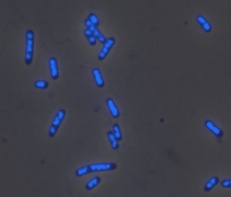 In a new paper in PLoS Genetics, Daniel Ferullo and Susan Lovett examine chromosome segregation during the stringent respons and discuss what appears to be a novel G1-like cell cycle checkpoint in bacteria that occurs as the result.